I’m a little behind the times. I’ve been committing my code to an SVN repository for the last five years, and the interwebs are all about Git these days. I decided to take it for a test drive. But with what? Almost a year ago, I started working on a data structures library in C# — not a useful library, just something I whipped up to essentially prove that I could still write a linked list and perform operations on it (such as reversing and sorting). It’s hardly something to brag about, but it’s a perfect test candidate for Git. I went looking for my project, and boy, does my ignorance know no bounds. When I authored this library, I thought it would be best to test it out using a console app, spitting out values to the console, and inspecting the output by hand. Obviously, I should have just expressed that as a series of unit tests, but I probably felt that doing so would slow my progress with the library. Stupid. So, I converted the console code to a series of unit tests in MSTest. (I’ve only ever used NUnit, but hey, this is an adventure, right?) And besides, I was going to be committing this code to a public repository on Github, and I wanted to spare myself from embarrassment. From there, I created an account with Github, and set up my first repository. Next, I installed Github for Windows to clone the repository on my local machine. Everything was in place. But, to make things a little easier, I installed Git Source Control Provider plugin for Visual Studio, which also required the installation of straight-up Git. (By the way, Github’s instructions for setting up Git are very good.) Using this plugin was certainly a welcome change from managing my source from outside the IDE. OK, so how do I “stage” my changes? Sure, I could open the shell, but do what, exactly? Well, Github for Windows seemed to offer no solution, so the shell quickly became my only option. I fired up Git Bash (part of Git), and typed git commit to see what happened. The response was that there was nothing to commit. Ah, so git commit is only local. I typed git help to see what other options were available, and git push looked like it had some potential. I tried that out, was prompted for my Github credentials, and bam — all of my local commits have been pushed up to Github. I’ve only gotten started. I have more code to add to the project, and I will try adding it from multiple machines to get a feel for the experience of team collaboration with Git/Github. Look for those details in a future post. Update: Github for Windows JUST made a liar out of me. I repeated all of these steps on another machine, made a small change, synced from Github for Windows, and pushed the changes to Github without any problems. Go figure! Update 2: It wasn’t Github’s fault, it was mine. 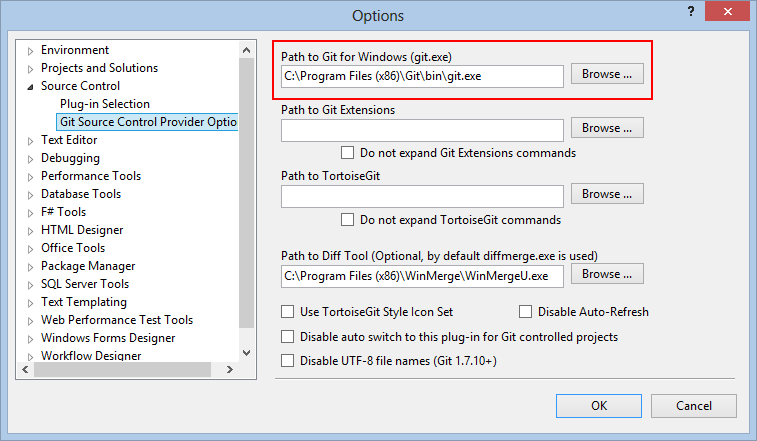 It helps when you point Visual Studio’s Git plugin to Git running on Windows. It helps when you provide a valid path to Git for Windows. 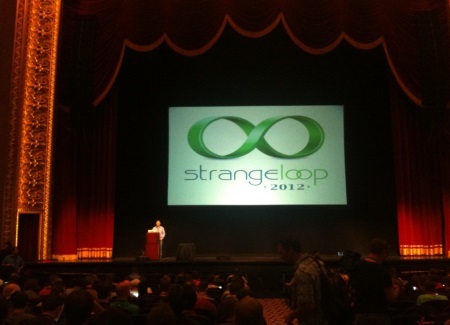 ANYway, Strange Loop is a fairly new conference (this is its fourth year) aimed to attract developers from various disciplines. Talks cover a variety of areas, including databases (both big and small), emerging languages, web and mobile development, etc. I first learned about the conference less than a year ago when I watched Rich Hickey’s keynote at last year’s conference. I was hooked. From talking to other attendees, I gathered that the overall theme changes from year to year, and this year there seemed to be lots of discussion about databases — in particular their methods of persistence, and the relevance of transactions and/or ACID. Opinions varied widely, and it was both amusing and informative to watch it play out. Strange Loop is about to begin. This year’s venue was the Peabody Opera House, which is gorgeous. There was ample room for attendees, the facility was clean and kept after, the acoustics were great, the WiFi was excellent, and the coffee was plentiful. The organizers of this event did a tremendous job putting all of this together. I did not attend the Emerging Language Camp pre-sessions, but I heard they were terrific. I did, however, attend the pre-party at the Schlafly Tap Room, enjoyed an Oktoberfest and listened to Teddy Presberg and the Restoration Organ Trio tear it up for about and hour and a half. Those guys were excellent. It was the perfect way to end the day, and to start off the conference. Michael Stonebraker keynoted the event with his talk titled “In-Memory Databases – The Future is Now!” Michael talked about what he calls “NewSQL” (that is neither traditional SQL nor NoSQL) and his implementation of it. I’m a little suspicious because the whole thing is single-threaded, and in my mind, that processor had better be bangin’ to handle all of that work. To be fair, though, multi-threaded databases incur a ton of overhead dealing with concurrency, and by making the database itself single-threaded, a tremendous amount of complexity can be eliminated. I remember not long ago when Twitter Bootstrap came out, and I made a mental note to check it out. Well, Howard Lewis Ship beat me to it and gave a very nice overview, complete with working examples. I’m not an active web developer, and am not up to date with all the latest frameworks (and there are many — it makes my head hurt, to be honest), but the promise of cross-platform and consistent look and feel coupled with ease of use make Bootstrap quite compelling. Stuart Sierra gave a talk titled “Functional Design Patterns,” in which he identified a series of coding patterns much like the Gang of Four, but specific to functional programming. One pattern he introduced as the state/event pattern, which, from what I can tell, is the same thing as event sourcing. He introduced a number of other patterns that I probably would have appreciated more if I was more proficient in a functional language. Apparently, many of these patterns are “monadic” in nature. Gary Bernhardt blew our minds with his talk titled “A Whole New World,” wherein he developed a new console, complete with interactive visuals. Impressive, no? Indeed … until we realized that he built the whole thing in Keynote. Lame! His point wasn’t lost on me though. We should not settle for old, dusty tools. Sure, the console is tied to the kernel, but so what?! We should want better tools, and we should build them … just not in Keynote. 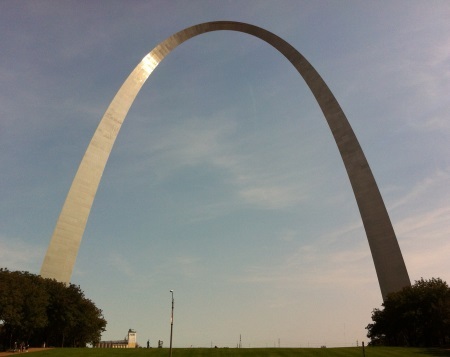 I snuck out of the conference long enough to check out the Gateway Arch. It’s even more majestic in person! Amanda Laucher and Paul Snively duked it out in their “Types vs. Tests: An Epic Battle” talk. Epic is kind of a strong word, but the talk was interesting. They worked on some code katas independently, and neither seemed to agree on the initial approach. E.g., do I write out all of my unit tests first, or define all of my types? They did seem to agree, however, that both types and tests have their places. As a C# developer, I’m quite comfortable and proficient with types. But, I’m really dragging my feet with TDD, and I was glad to hear that I’m not the only one who dreads the thought of writing tons of unit tests. Say what you want, but it’s downright dreadful. Rich Hickey challenged my thinking with respect to databases with his talk, titled “The Database as a Value.” Relational databases historically have been a necessity in order to minimize storage space. Today, however, storage is cheap and ubiquitous, allowing developers to consider data persistence alternatives. Rich made the argument that developers commit code to version control systems without regard for space consumption, and such systems keep each revision forever. No relational database offers that, but we should want it. In fact, we should demand it! (Permalinks, anyone?) Not only is Rich demanding it, he’s building it. For those of you who did not attend, all of the talks have been recorded and will eventually show up on InfoQ. Also, talk contents (slides, code, etc.) can be found here.